The planet cannot be seen directly, yet it can be detected even by amatuer astronomers. 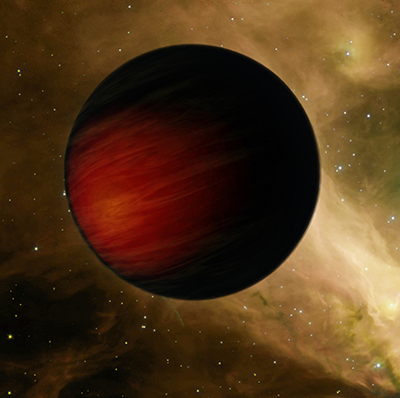 Planets like these are discovered when studying the changes in the brightness of stars. If a star becomes very slightly dimmer periodically, then something must be orbiting it. This particular planet orbits its star really fast in a "torch orbit". It makes one orbit in as little as 3 earth days. The planet is 114 times more massive than Earth; less massive then Jupiter, but more massive than Saturn. The planet is unexpectedly dense for a gas giant of its mass and size. Humans tend to classify objects into categories, but space objects continue to strike us with their individual uniqueness. HD 149026b is extremely hot. The temperature was initially estimated to be 1540K. At this temperature, silicon starts boiling and iron is melted. At the time of its discovery, it was two times hotter than the hottest planet known at the time. The planet is believed to look "darker than coal". However, some scientists imagine an amber glow to the planet. The actual appearance is not known. Proponents of the theory that the objects of the Solar System formed from smaller objects of the initial nebula, were quick to suggest that a heavy planet like HD 149026b is prime evidence for such solar nebula accretion model. However, critics of the theory, point out that discovery of one such heavy object is by far not enough evidence. Besides, the core of the planet is so huge, not even the solar nebula accretion model is able to explain it.